What do I look forward to the most when I come to Austria to visit my family? -Apfelstrudel! (And the fam, of course…!) More specifically, Geli’s Apfelstrudel! Ever since my dad’s girlfriend veganized her Apfelstrudel for me last year, I have been waiting in anticipation to return and indulge in it again. Seeing as I’m Austrian, I think it’s about time that I shared a traditional dish from my country of birth… In Austria we buy a ready-made pastry that is especially for the Strudel, but it can be used interchangeably with Phyllo – which is what I recommend for this recipe. When you prepare your pastry Geli suggests leaving it to sit for a few minutes after brushing it with oil, so that the Oil can soak in and make the pastry a bit more flexible. Just make sure you have it lying on a damp cloth to stop it from drying out. According to Geli, the trick to making a juicy Apfelstrudel is to grate the Apples instead of just slicing them – it works a charm! The measurements are all a bit rough as she eyeballs her ingredients, so be sure to add more or less, according to your taste. 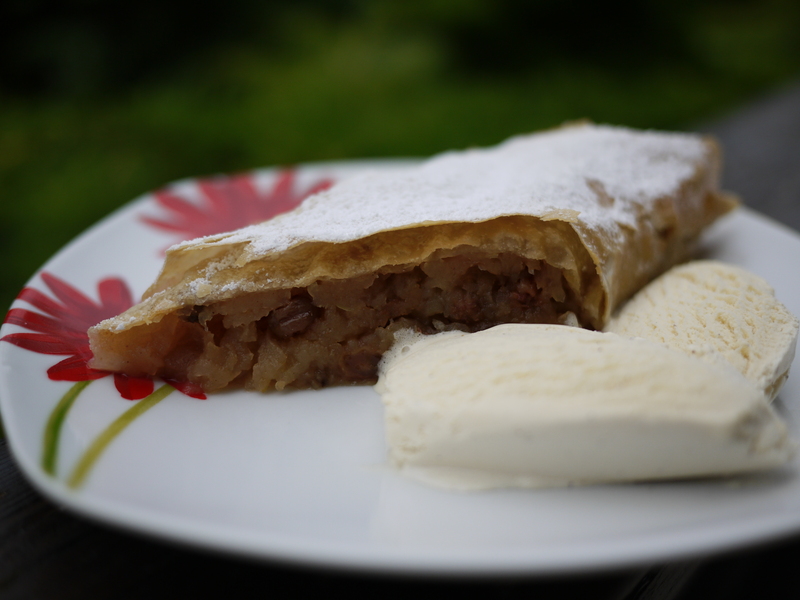 So here it is – Geli’s delicious (and easy) Apfelstrudel! 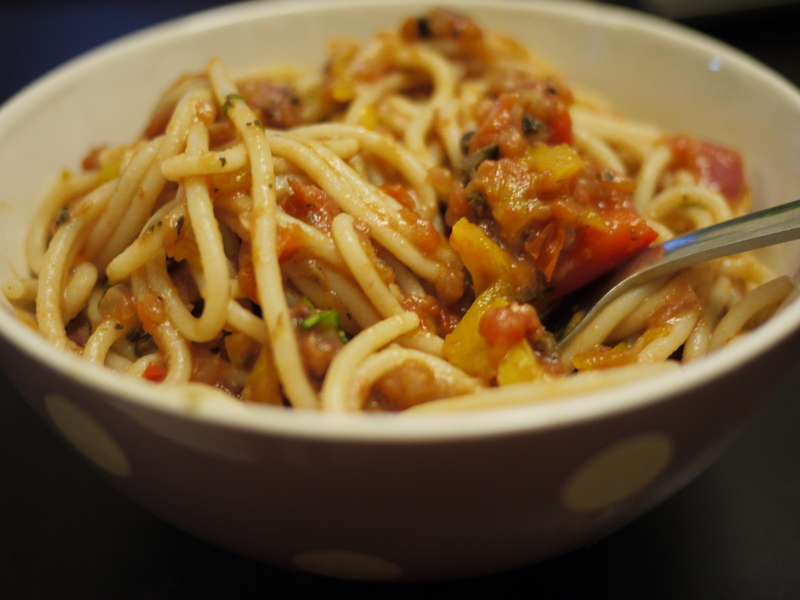 – Preheat oven to 160C, and lightly grease or line a baking tray. – Have two cloths ready: wet one of them with hot water, and wring it out so it isn’t dripping wet. Lay it on the counter, and cover with the other dry cloth. Remove one sheet of Phyllo and lay it over the top of the cloths, then thinly brush it with Oil covering the whole surface. Carefully lay the other layer of Phyllo over it, and allow the pastry to stand whilst preparing the filling. – Place the grated Apples in a large bowl and add fresh Lemon Juice, Cinnamon, Sugar, Maple Syrup and Raisins. Pour the Amaretto over it, and mix well. Taste and adjust sweetner/Lemon Juice as needed. – Spoon the Apple mixture over the bottom third of the Phyllo square, shaping it into more of a dome (don’t make it too flat or your roll will end up flat). Carefully lift the towel up from the bottom edge and use it to slowly roll the pastry over the filling, making sure not to touch the pastry, and also keeping it rolled tight over the filling. Do this all the way to the end until you have a tight roll that is nicely shaped. Tuck it in at both sides, and then using the cloth from underneath, slowly move it to the tray. – Bake in the oven for 30-40 mins. until the top is browned and the Apples are cooked through. Once out the oven, allow to cool and dust with Icing Sugar.